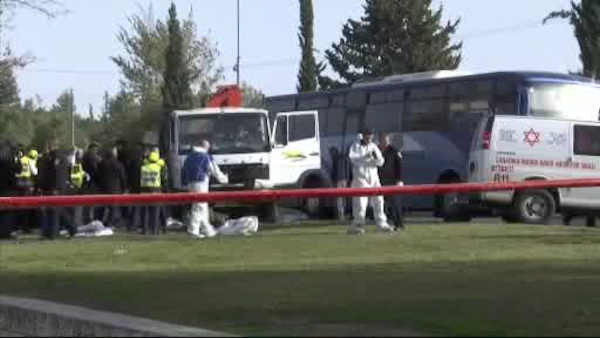 JERUSALEM -- A Palestinian truck driver rammed his vehicle into a crowd of Israeli soldiers at a popular Jerusalem tourist spot Sunday, killing four people and wounding 17 others in the deadliest single attack of more than a year of Israeli-Palestinian violence. The attacker, identified as 28-year-old Fadi Qunbar, came from the Palestinian neighborhood of Jabel Mukaber in east Jerusalem - located near the attack site. The toll from Sunday's attack matched that of the deadliest previous assault- the Tel Aviv shooting last June carried out by a pair of gunmen at a popular tourist spot.